Right after New Year's I traded my table saw and my RAS for a car: A 1986 Saab 900s. 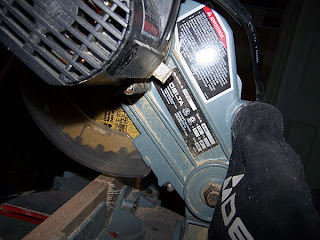 That left me without any good cutting tools other than the rust pile old Rockwell table saw I've been wanting to fix up. So I was surfing Craigslist and stumbled on this little guy. 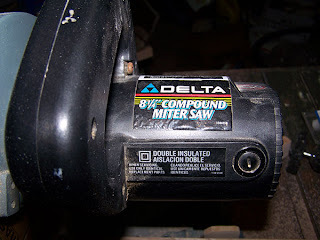 A 8 1/4" Delta Compound Miter Saw. Last Sunday I went and checked it out and decided it was worth the asking price. Took it home and did some test cuts. It was already dialed in at 90* and 45*. Sweet! Stuck a quick aux fence on it from 3/4 x 10/4 red oak (so I could get a zero clearance backing for the cuts), greased the rollers for the guard, and had some fun with it. It cuts pretty good considering it has a crappy Vermont American blade on it. 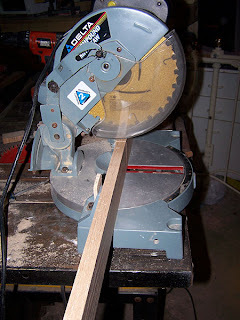 This saw is very small, perfect for my one-car garage "shop". And with the accuracy of its cuts, is perfect for picture frames and pen blanks and the like. 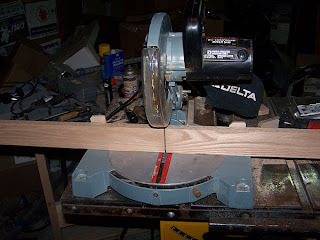 I debated building a stand for it but decided that I want to be able to stick it under the bench when not being used. It's small and light so that's no big deal, but I may decide it's more convenient being permanently mounted to the bench for quick cuts when needed. I have to say that it was worth every penny of the $20 it cost.